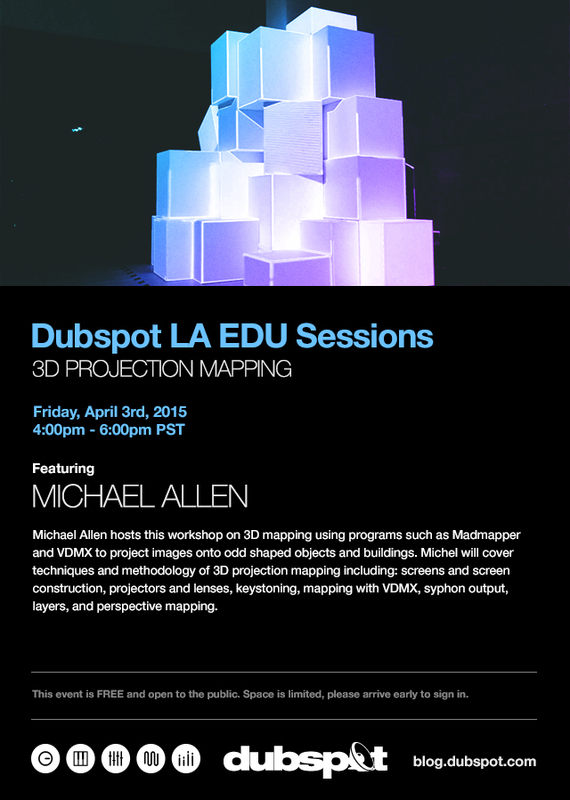 On Friday April 3rd, join us for a free workshop hosted by visual performer and Dubspot Instructor Michael Allen on 3D mapping using programs such as Madmapper and VDMX to project images onto odd shaped objects and buildings. Join us for a free workshop hosted by visual performer and Dubspot Instructor Michael Allen on 3D mapping using programs such as Madmapper and VDMX to project images onto odd shaped objects and buildings. Michel will cover techniques and methodology of 3D projection mapping including: screens and screen construction, projectors and lenses, keystoning, mapping with VDMX, syphon output, layers, and perspective mapping. Since 1995, Michael Allen has been using light and multimedia to manipulate environments at shows, clubs, and other events. From the slideshows, overhead projectors, and 16mm presentations of the ’90′s – to the video projections, tv’s, and analog mixers of the last decade – to the LED screens and hi-tech software and hardware of today – he uses evolving technologies in the burgeoning video performance field to entertain the eyes as well as the mind. Michael uses visuals to enhance performances and productions. He has toured with acts such as Tripping Daisy, The Polyphonic Spree, Bowling For Soup, Zebrahead, Digable Planets, and The Pharcyde, among others. Most recently, he toured as lighting designer with the LA band, Warpaint. He also performs with DJs and has shared the stage with Cut Chemist, Mix Master Mike, Steve Aoki, and many, many others. Over the past 10 years, Michael has done installations and VJ’d at some of the biggest music festivals in the world (Electric Daisy Carnival, Coachella, Rock The Bells, Burning Man, etc.). Also, he’s held VJ residencies at popular Hollywood nightclubs Avalon, Cinespace, Dim Mak Studios, Supperclub, Lure, Star Shoes, and more. Visit Project-ION to see more!